Click here for Wood "Sleeper" Construction Details page. It seems like this would be more time consuming than it was, but this project was the only one that actually went faster than expected - only about three full days. The link above tells the story of how I streamlined this process greatly. 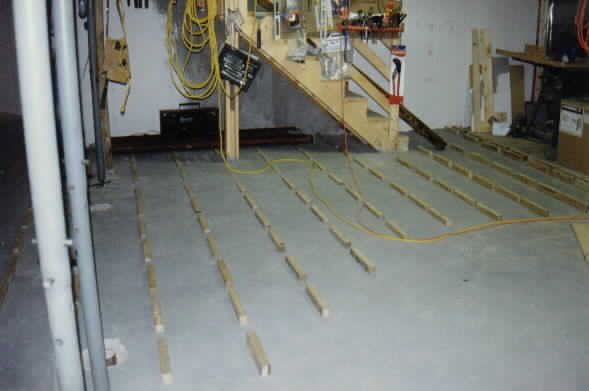 Next, is the plywood subfloor. This was relatively straightforward - using glue and nails to fasten the panels on top of the sleepers. 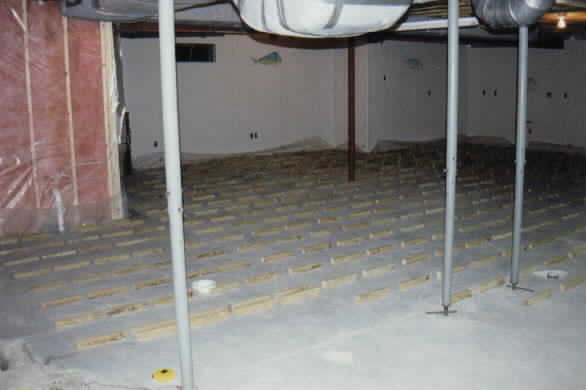 Here is a shot of the finished subfloor. You can see the boundaries of the room start to come into view. The diagonal part on the right is the wall where the grouper is now. 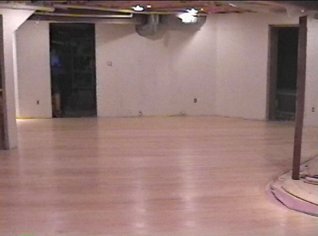 Note also the use of the rotary laser level (yellow) on its side to mark the floor and ceiling for where that wall will be. Click the image to see this diagonal wall at drastically different times. Click here for the Hardwood Flooring page. 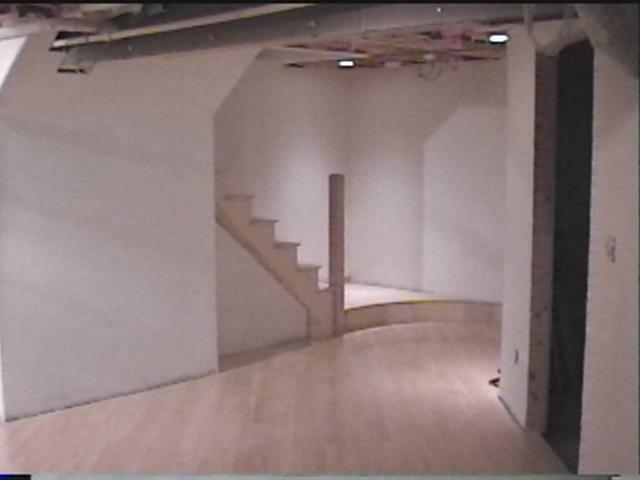 Next came the Birdseye Maple hardwood floor. This was a tremendous amount of work at each stage. 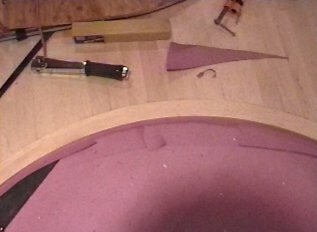 Even laying out which boards go where was a job - Thanks, dad for accomplishing this so I could follow behind with the flooring nailer! Click here for the Curved Border section. Sanding should have been easy compared to laying the floor, but it definitely wasn't! The results are quite rewarding, though. 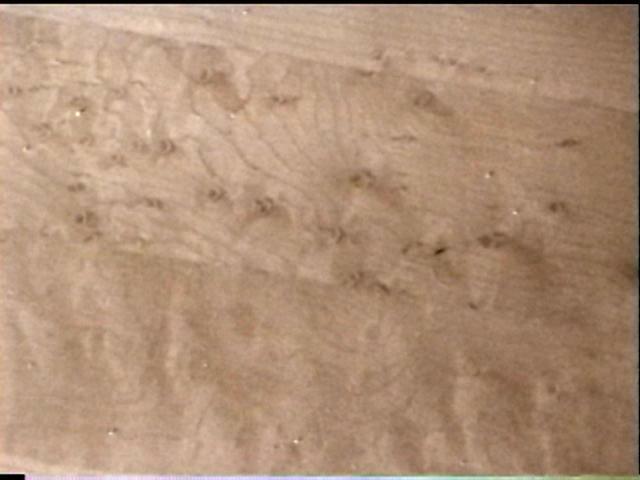 here's a close-up of what birdseye maple looks like. The figure is extremely striking (especially for 600 Sq Feet of floor!) and looks particularly good under halogen lights. I selected this because it has an organic "sandy bottom" look that goes much better with an underwater theme than Oak. Another interesting visual feature was the curved landing at the bottom of the staircase. 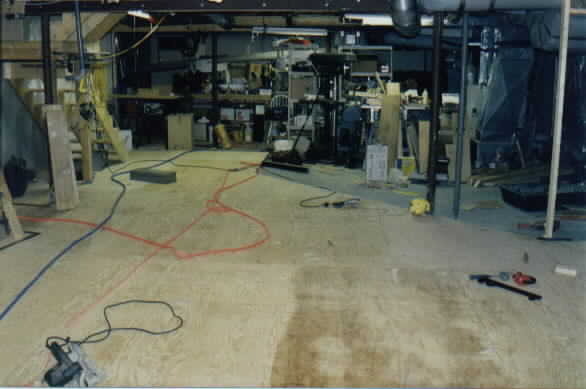 I included this picture here because it is one of only a few newly finished floor pictures. The picture is a hyperlink to the full image. 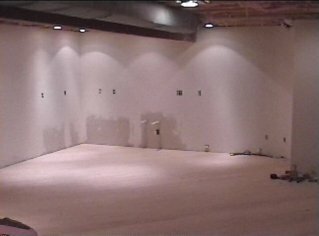 Now (7/17/00) the carpet is in! The contrast with the hardwood really brings out the curved border. Note the attraction that the cat has to this insanely deep pile that resembles sea grass. The picture is a hyperlink to the full image.